Ultra 500FT 350MHz Unshielded Twisted Pair CAT5e Patch Network Cable - 500FT, CAT5e, UTP, Green (Solid Cable) - NWCA Inc. 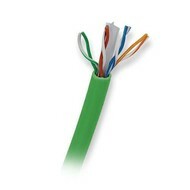 The Ultra 500FT 350MHz Unshielded Twisted Pair CAT5e Patch Network Cable allow you to connect with ease. Whether being used for servers, routers, gaming consoles or cable modems, the Ultra 500FT 350MHz Unshielded Twisted Pair CAT5e Patch Network Cable is made of the highest quality materials to provide you with the most reliable high-speed connection available.